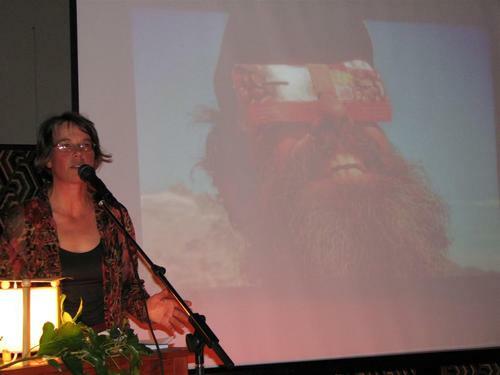 K.Linda Kivi has been passionately exploring our human connection to land through her many books, both fiction and creative documentary. Raised in an Estonian refugee family in Toronto, Ontario, she moved to the Columbia Mountains of British Columbia twenty years ago. She is also an avid naturalist, a wilderness explorer and a gardener. She lives on a land co-op in the Kootenay River valley. 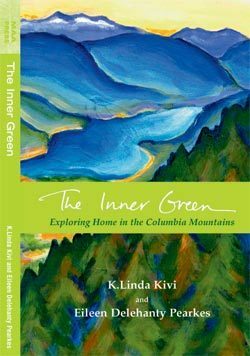 The Inner Green: Exploring Home in the Columbia Mountains (2005), was written collaboratively with Eileen Delehanty Pearkes. Combining art with science to portray the natural history, ecology and beauty of the Columbia Mountains of BC, these literary narratives are popular with both locals and visitors to the region alike. The authors have delved into their connections with place and captured the essence of the Inland Temperate Rainforest ecosystem. 224 pages. The Purcell Suite: Upholding the Wild (2007)is an anthology of twenty-five narratives and poems edited by K.Linda Kivi. Both Canadian and US writers explore the ecological wonders and complex beauty of the Purcell Mountain range of South-eastern BC and the US North-west in this remarkable book. 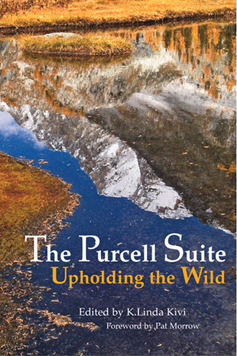 With intimate contemplation of the land, work, historical journeys and an understanding of the ecology of these mountains, The Purcell Suite includes a diverse selection of writings united by a common sense of place. Voices include such popular literary names such as Stan Rowe, Rick Bass, Luanne Armstrong, Janisse Ray, Tom Wayman, Pat Morrow and Fred Wah as well as First Nations spokespersons and historic figures such as climber Conrad Kain. 240 pages plus 16 pages of colour photos by prominent photographers. Letter from Lubumbashi is K.Linda Kivi's latest novel, to be published by New Orphic Press in 2009. This moving story follows the life of Congolese refugee, Joseph, as a chain of events brings up his troubled past. Set against the backdrop of his bucolic, suburban life in Canada with his wife and children, memories of the Congo Crisis come to haunt him with dramatic results. The novel, If Home is a Place, delves into the passionate and complex relationships between mothers and daughters as well as bringing to light the issues refugees face in their quest for home. In this powerful story, K.Linda Kivi reveals how emigration can form the psyche of a people for generations. Dispossessed of their native Estonian home during World War II, three women struggle to survive in war-torn Europe. In Canada, 50 years later, home is still not a given. As Esther, the grown daughter of Sofi, witnesses the dawning of Estonian independence, she unravels a legacy of exile and discovers both a physical place as well as a place within herself that is home. 280 pages. K.Linda Kivi is also the author of Canadian Women Making Music, a history of Canadian women's involvement in the music industry since 1867 and features interviews with prominent composers, songwriters, musicians and performers. She also wrote the collaborative text about alternative relationships, Fidelity, with three other women.